There are different ways to arrange our books- in the box, under the bed, on the floor, on the table, and of course, on our beautiful shelves. The art of arranging our books- there's something quite therapeutic about it eh? 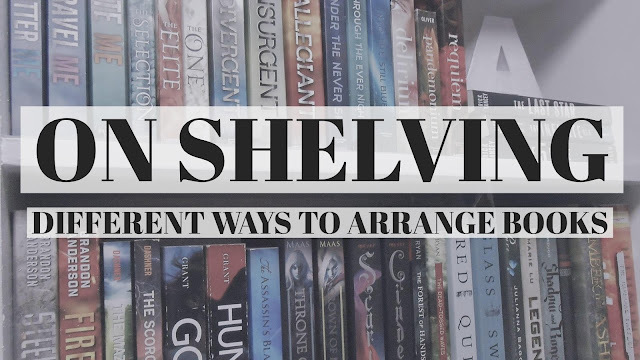 Some may have already figured out their own system of shelving, and some may have not. It may vary from time to time, depending on the mood, or not. But regardless, each of us bookworms has his or her own preference. Thus for this post, I thought of enumerating some common ways of arranging or cataloging books. Regardless of the genre, you can arrange and catalog your books by author's last name or by book/series title. This is a very simple system yet still quite all over the place. I used to do this system before but abandoned it later on for a more 'organized' approach. Haha! For a more systematic cataloging, next would be by genre, then either by author's last name or by book/series title or no system at all, just by genre. If you read from a wide range of genre, I think this will help you find/pick a book easier especially if you're just wanting to read from a specific genre. For those with a lot of TBR (ehem, guilty), you can first divide your books to Read books and Unread books. From there, you can arrange by genre. If you're feeling a little more organized, you can also arrange by author's last name or book/series title. Or from read/unread category, you can directly arrange by author's last name or book/series title. Okay, I am not really sure if this is a common way of arranging books. Probably not. Haha! But there, you can also arrange books by publication date. How about you? How do you organize your shelves?